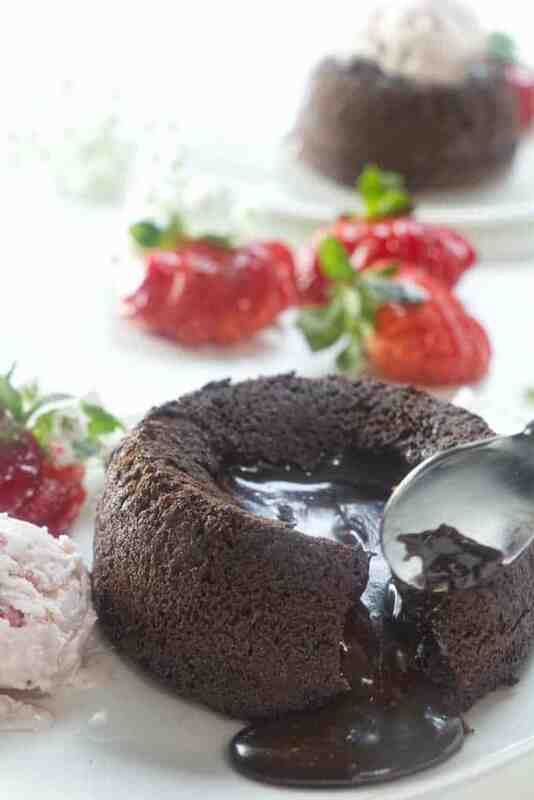 Molten chocolate lava cakes are absolute stunning desserts! These little cakes are rich and decadent and magical. 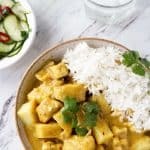 We give you instructions for three different size dishes including cupcake tins so you will have every excuse to make these tonight. 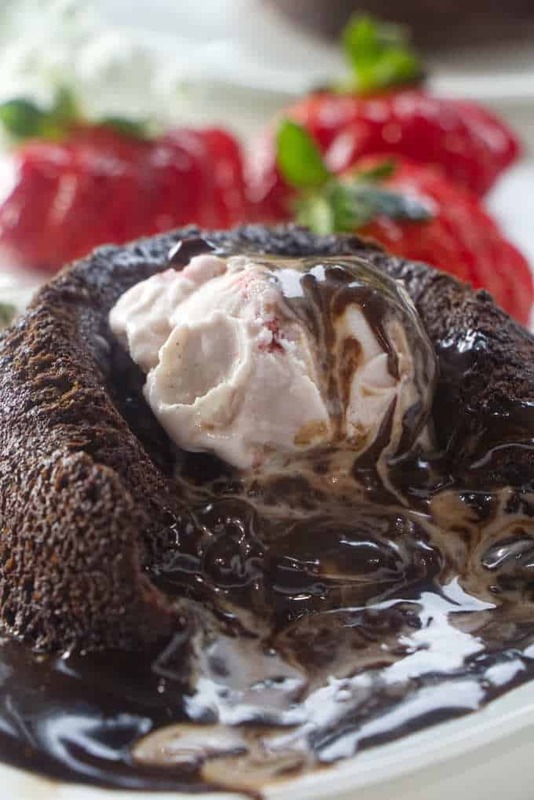 You’re going to love how easy it is to make these molten chocolate lava cakes. You don’t need any special equipment or special ingredients. You can whip these up by hand in one bowl. These are the best molten chocolate lava cakes ever. We went out of our way to make sure these little lava cakes have the maximum chocolate lava goodness. These little babies are PACKED with chocolate that turns into a rich, warm, fudgy sauce in the center of the cakes. It’s kind of like a self-saucing cake! 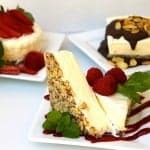 All you need is a scoop of ice cream and you have a cake and a hot fudge sundae all in one! Before you start, heat the oven to 425°F. The lava cakes need to bake at a high temperature so they get cooked on the outside but keep all the melted chocolate goodness on the inside. Now, you need to get the baking dishes ready. 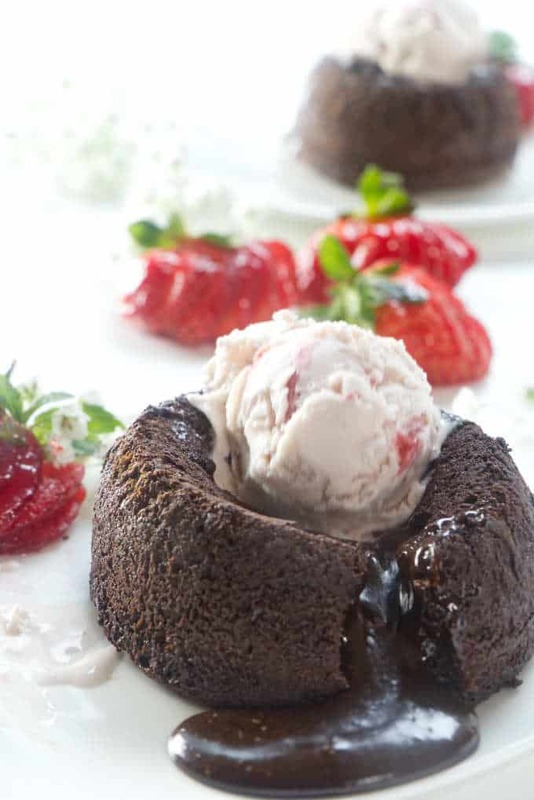 You can make these little molten chocolate lava cakes in 6-ounce ramekins, 4-ounce ramekins or in cupcake tins. 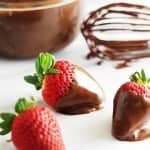 This recipe will make 4, 6, or 8 molten chocolate lava cakes, depending on which size baking dish you use. So grab the container that you want to bake them in and coat the insides with some butter. Next, sprinkle some cocoa powder inside the dishes and shake them around so the cocoa evenly coats all the sides and the bottoms of the dishes. By coating them in cocoa powder, the lava cakes will come out perfectly chocolatey looking. The batter is too simple to make. Just pop the butter and chocolate in the microwave to get them melted. Stir the sugar in with a fork or a whisk until it looks smooth then add the rest of the ingredients and whisk it real good. You will notice the recipe calls for espresso powder. These little cakes do not taste like espresso. 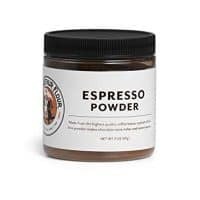 The small amount of espresso powder that you put in will only highlight the chocolate flavor. If you want these molten chocolate lava cakes to taste like espresso then triple the amount of espresso powder. And, if you don’t have espresso powder then don’t let that stop you from making these little lava cakes. 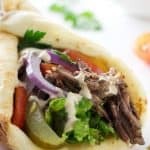 Just skip that ingredient and they will still be amazingly delicious. Now it’s time to bake the little cakes. The amount of time you bake them will depend on what size baking dish you choose. If you have 6-ounce ramekins, you can make four molten chocolate lava cakes. 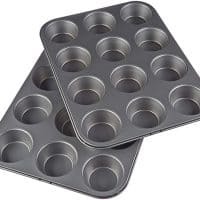 The 4-ounce ramekins will make six cakes and the cupcake tins will make eight little lava cakes. The cakes need to bake at a high temperature which will give them a nice crust on the outside but keep them saucy inside. You will know they are done when they puff up about 1/2 inch above the rim and they will jiggle in the center when you shake them. Take them out of the oven and let them sit for about 2 to 3 minutes before you invert them on a serving dish. 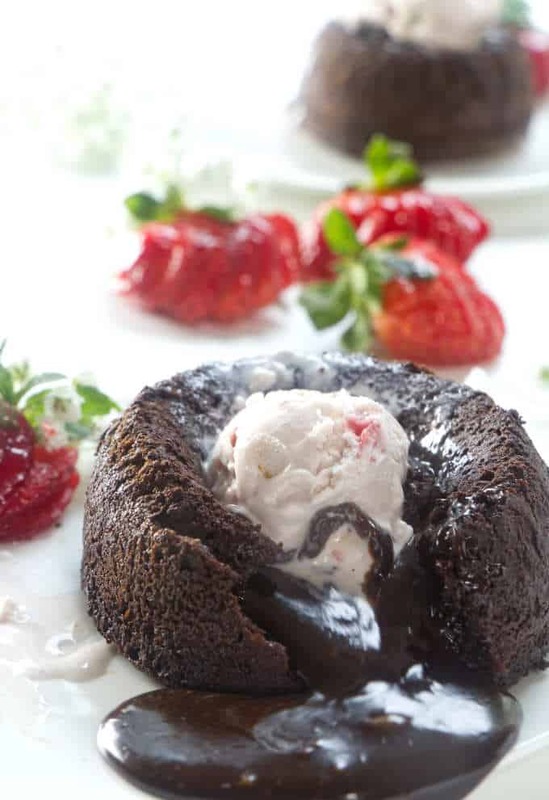 These molten chocolate lava cakes are best served while they are still warm. That means you want to bake them about 12 to 15 minutes before it is time to serve them. 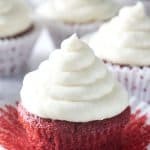 The great thing about these little cakes is you can mix the batter a day in advance and then bake them when you’re ready for dessert. If you want to mix the batter ahead of time then pour the batter into the baking dishes and cover them with plastic wrap. You can store them in the fridge for 24 hours. When your ready to bake them take them out of the fridge and let them sit on the counter for 20 minutes. let the oven come up to temperature, then remove the plastic wrap and stick them in the hot oven. Can you make these chocolate lava cakes in a mug? You can bake these little lava cakes in a mug but you will need to pay attention to the size of the mug. They do best in small, shallow mugs. Tall mugs will leave too much batter uncooked and the cakes will come out quite messy. If you use a mug, make sure you select a mug that is oven-proof up to 425°F. Six-ounce mugs work great but if you are using larger mugs then only put 3/4 cup of batter in the mug. 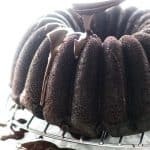 The molten chocolate lava cakes in these pictures were baked in cupcake tins. Our favorite size however are the 4-ounce ramekins. Not too big, not too small. Just right! The calories and nutrition label was calculated on the molten chocolate lava cakes from cupcake tins. You get eight mini molten chocolate lava cakes if you use cupcake tins. You really have to make these. 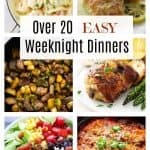 They are incredibly delicious and so easy to make that you will want them every night. 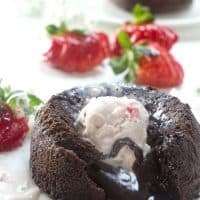 These molten chocolate lava cakes are rich and decadent desserts that are filled with a warm fudgy sauce. There are instructions for three different size dishes including cupcake tins. Melt the butter and chocolate. You can either place them in a double boiler or melt them on low power in the microwave. Stir in the sugar until smooth. Add the eggs, egg yolks, vanilla, espresso powder and salt. Whisk well until smooth. Stir in the flour then divide the batter among the baking dishes. Bake until the edges are firm but the center is still soft. For 8 standard sized cupcake tins, bake 7 to 8 minutes. 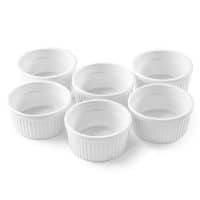 For 6 (4ounce) ramekins, bake for 9 to 10 minutes. For 4 (6 ounce) ramekins, bake for 11 minutes. The cakes will puff up a bit and get firm around the edges but jiggle in the center. Remove the cakes from the oven and let sit on a wire rack for 1 or 2 minutes. Run a knife around the edge of the cakes to loosen them from the baking dishes or the cupcake tins, then invert them onto serving plates. Use either six (4- ounce) ramekins or four (6-ounce) ramekins or eight standard cupcake tins. Do not use chocolate chips in this recipe. Chocolate chips have additives that will prevent the center of the cake from having a nice runny lava. For best results, use your favorite dark chocolate candy bar, bakers chocolate or chocolate baking disks. The batter can be made a day in advance and stored in the fridge until it is time to bake them. If you make the batter in advance, fill the baking dishes and cover them with plastic wrap. When it is time to bake them, pre-heat the oven and let the cakes sit at room temperature for 20 minutes before placing them in the hot oven.